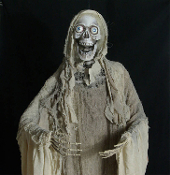 Ghost of Christmas Past or Future for your own Christmas Carol scene or Nightmare Before Christmas theater play scenery... Sound-activated... with funky Light-Up googly eyes and swaying torso, this hanging Halloween haunt prop decoration will shiver your timbers! NEW detailed hangman dead body is certain to send chills up your spine! A 60-inch not-quite-fresh decaying body, dressed in rotted fabric shrouds, hangs from a nylon rope. Measures 13-inch wide at shoulders and comes with hangtag. Has Demo mode, as well as sensor. Complete with full skull, 3 rows of ribs (front and back), and cloth-covered padded wire posable arms with skeleton hands. *Requires 2- ''AA'' batteries (*DEMO INCLUDED).